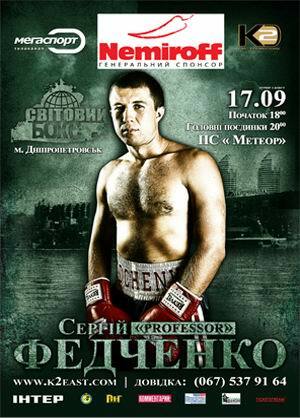 WBO #7 and IBF #15 junior welterweight Sergey “Professor” Fedchenko will headline a huge K2 East card, which is penciled to take place 17 September at Meteor palace of sports in Dnepropetrovsk, Ukraine. Fedchenko, 28, a sound technician with a sneaky but hard right hand will put his IBF Intercontinental title at stake for the third time against South African Kaizer Mabuza (21-6-3, 13 KOs). Fedchenko (23-0, 11 KOs) is coming off an April win over Argentinean Diego Jesus Ponce. Mabuza, 29, the national champion at the time, is currently on the heat streak, which includes two easy stoppages of then-unbeaten Namibian Jason Naule and a tough close win over Samuel Malinga. He is best known, however, by two losses to the reigning IBF welterweight champion Isaac Hlatshwayo at the starters of his pro career. In the main support bout of the evening, undefeated Ukrainian heavyweight Andrey Rudenko (14-0, 7 KOs), 26, will duke it out against Kazakh road-crowd-pleaser Talgat Dosanov (13-12-1, 6 KOs), who was stopped by world-ranked Alexander Ustinov in his last fight. The card will also the comeback of former world champion and now WBA #7 welterweight Yuri Nuzhnenko (28-1-1, 13 KOs), who is set to see action for the first time since his April loss in all-Ukrainian mega fight to Vyacheslav Senchenko. He will reportedly face Uzbek Mamasoli Kimsanbayev (11-1, 4 KOs) over eight. Another fighter to make his return after a bitter loss is Vitaly Rusal (23-1, 16 KOs); he is coming down in weight after being blown out in five by the newly crowned WBO cruiserweight champion Marko Huck. Though his opponent wasn’t announced, rumors hold Vasyl Kondor (18-6-1, 5 KOs) as his next test. Prospects Dmitry Nikulin (18-0, 5 KOs), Valentin Golovko (9-0, 5 KOs) and Dmitry Semernin (1-0, 1 KO) will shape up the card against yet-to-be-determined opponents, while Mamed Yadgarov (12-5, 6 KOs) will incrust the undercard.